Well, it seems that our last article about how to drive safely when the roads are icy was particularly timely because the weather here in Littleton is finally starting to feel like winter. Although it seems like we got off to a bit of a slow start, before you know it, the ground will be covered with snow and the roads will be pretty slick. There’s a lot to love about living in Colorado, but the (at times) poor driving conditions can be enough to make anyone frustrated. Add in the fact that the days are incredibly short — there’s nothing worse than waking up when it’s dark, driving to work in the dark, spending all day inside at a computer, getting off work when the sun is setting, and driving home in the dark — and it’s enough to make anyone yearn for spring. Winter is a common time of year to get the blues, but that’s why Summit Riverside Apartments, your source for luxury apartments in Littleton, is here to offer a few tips to help make your winter a little bit brighter. Keep reading to learn more! Whether it’s because it’s always dark or because the roads can be icy, people have a tendency to retreat to their living spaces in the winter and not want to come out. Perhaps it’s our natural instinct to hibernate, but the truth is that making it a point to get outside and spend time with people can make a big difference in your mood. It could be as simple as asking a friend to get lunch. At the end of the day, the more time you spend with people you care about, the happier you’ll be. For some, the solution is to go see a movie with a significant other; for others, it might be inviting people from work over for dinner. However you choose to spend your free time, as long as you make sure to involve other people, you can rest assured that it’s a great way to boost your mood. 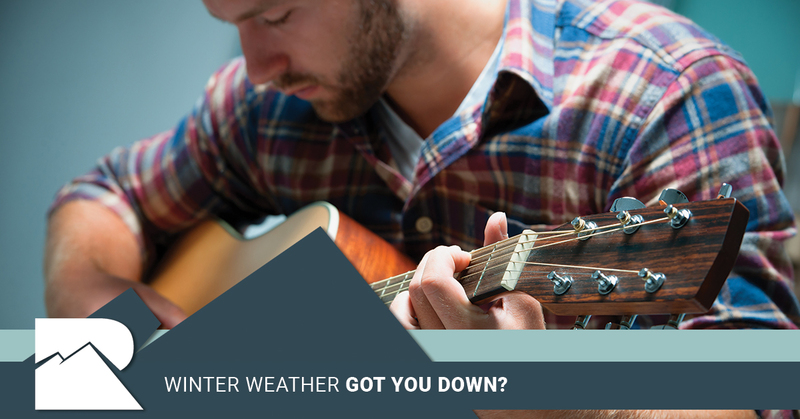 Winter is known for its massive amounts of downtime. This makes sense, of course, because it’s just much easier to spend time outside in the spring and summer, and there’s a whole lot to do here in Colorado when it’s nice outside. But with so much time spent indoors, it represents the perfect opportunity to try out a new hobby. Always wanted to take up knitting? Head on over to the library, grab a book or two, and start learning more. Interested in learning to play the guitar that’s been sitting in the corner of your bedroom for two years? Pull up some videos on YouTube and play along with the instructor. If you’re willing to think outside the box a bit, you’ll find that there are plenty of hobbies to take up that you can do from the comfort of your home. Science has shown time and time again that getting exercise can help with everything from insomnia to depression. What better way to fight the winter blues than with a fair bit of exercise? Although it can be tempting to go into full-on hibernation mode, eating hearty foods, and bundling up on the couch to binge watch an entire season of a new show, the truth is that being active can make all the difference in the world in terms of your happiness. Thankfully, if you’re a resident of our Littleton apartments, you know that we have a 24-hour fitness center. That makes it easy to get a good workout in whether you prefer to lift a few weights or spend some time jogging. Sure, it’s easier to have a good workout routine when the weather is warmer, but if you can get into the habit of working out in the winter, you’ll experience a number of really incredible benefits. Great Amenities to the Rescue! We mentioned the 24-hour fitness center as one of our amenities, but the amazing thing about that is that it’s only the tip of the iceberg in terms of what you can experience in our community. We’re also proud to offer a new contemporary clubhouse, an internet cafe with coffee station, outdoor heated saltwater pool, barbecue grills, a full-size basketball court, playground, security gates, and more. In other words, there’s a whole lot to love about living here. If you’re searching for pet-friendly apartments in Littleton, you’re in the right place. We’re a community that absolutely loves pets and once the weather gets warmer, you and your dogs will enjoy nearby parks, local natural areas, plenty of trails, and new onsite Bark Park that’s coming soon! Searching for 1-bedroom apartments, 2-bedroom apartments, or even apartments with loft space? We have you covered at Summit Riverside Apartments. With stainless steel appliances, full-size washers and dryers, designer flooring, patios and balconies with plenty of storage, wood-burning fireplaces (perfect for winter! ), walk-in closets, and central heating and air, you’re sure to love living here. Whether you’ve lived in Littleton for years and you need a new place to live or you’re new to the area and you want to live in a luxury apartment, we’d love to show you around. Contact us today to request a tour or click here to apply now if you know this is the place for you. Either way, we look forward to meeting you!